Today is the final day of the countdown teasers for the February release from Clearly Besotted. All stamp sets and coordinating dies will be available for purchase on Friday 1st February 8pm GMT at Clearly Besotted and Simon Says Stamp. 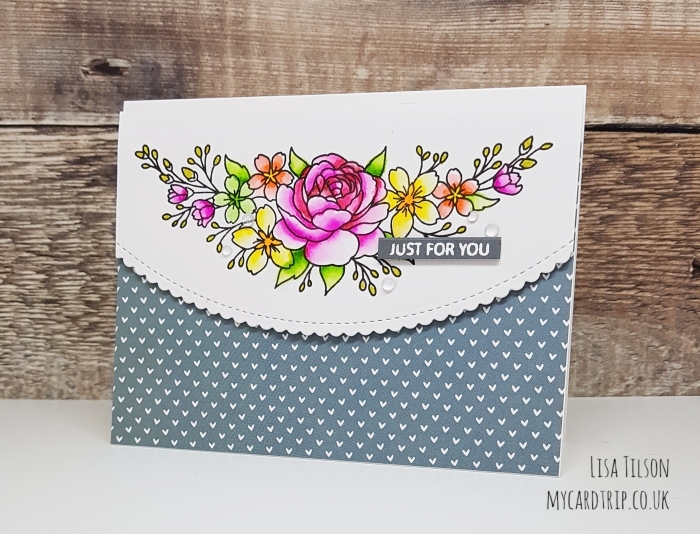 For my final card, I am using the beautiful Floral Spray stamp set. This is a larger A6 set and contains two super pretty floral spray images. So, here is my card for today. Before we get into the card, I would like to reassure you that you haven’t come to the wrong blog – I have broken out my supply of patterned paper for this one – more about that later! But isn’t that stamp just BEAUTIFUL! And so relaxing to colour. I chose to position mine horizontally across a panel, but I think it would look equally lovely down the side of a vertical panel too. Or even one at the top and one at the bottom of a panel with a sentiment in the middle. So, to begin, I stamped the floral spray with Versafine Onyx Black ink onto Bristol Board cardstock and then die cut the panel with an MFT Stitched Scallop Basic Edge Die. I then set about colouring it with my Zigs. And as I knew I was going to have a mid grey coloured bottom section to the panel, I wanted bright colours for the flowers for maximum impact. The Zig colours are listed below if you are interested in what I used. Once it was finished, I set it to one side to finish drying and I searched through my very old stash of patterned paper and found this lovely paper from Lawn Fawn Let’s Polka (sadly this is now retired). I trimmed it to fit my A2 top folding horizontal base card and adhered it with DST. I then added some foam tape onto the back of my coloured panel and popped that on top, making sure to leave a little gap at the top for added interest. 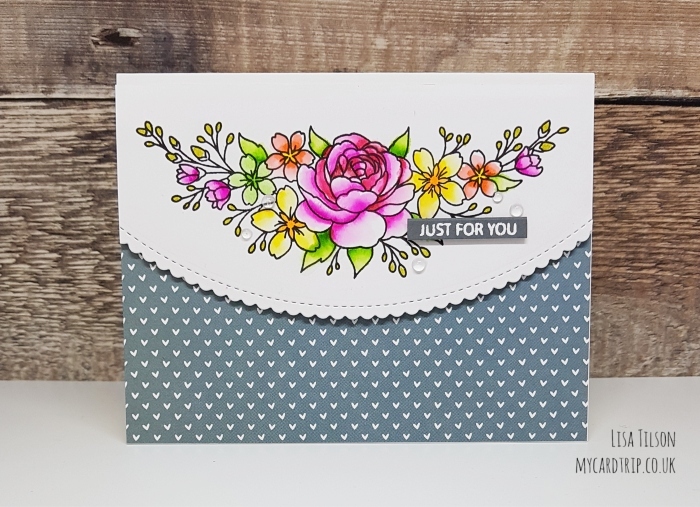 The sentiment from Clearly Besotted Tiny Type was stamped with Versamark onto some grey cardstock and die cut with the oh-so-useful SSS Sentiment Label dies. I adhered this with foam tape and then finished the card with some Raindrops from Lucy’s Cards. I love how this turned out and it’s really nice to use some of my patterned paper! I did throw a load of it out recently but kept the packs I loved the most and I am glad I did. Maybe I need to get some more haha. I honestly don’t know why I don’t use it more, it can provide a really nice contrast to the colouring. 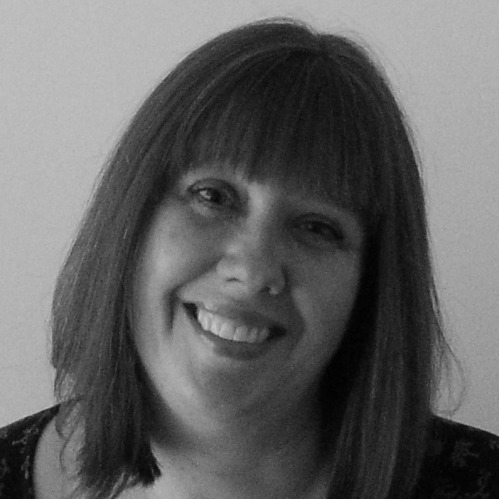 We hope you have enjoyed the teasers this week and if you have some time and would love a bit more inspiration, it would be wonderful if you could head over to see what Stephanie, Michelle and Keren have created for today. Thank you for joining me this week and happy crafting! Zig colours used: Pale Green, Light Green, Mid Green, Yellow, Bright Yellow, Scarlet Red, Pink, Dark Pink, Wine Red, Deep Red. Beautiful card. Love the colours and the pattern paper is great. This is a beautiful card. I love the flowers. The Zig colors you chose are fantastic. Gorgeous layout, pretty colours & a great size of stamp. I’m so envious of all of the florals I’ve seen this release. Mine never look real, think this might have to be my practice set for Kathy’s next 30 day challenge till I get flowers the look like yours. Thank you for sharing. Gorgeous card! Love the floral design! I have this paper pack and I love how you used it, lovely card! I just have to get my Zigs out the coloring is so pretty! That was supposed to say “the grey of the paper against the bright colours in the flowers” haha! Sorry!